2003 Paul Reed Smith PRS SE EG Budweiser Graphic. 2003 Paul Reed Smith PRS SE EG Budweiser Graphic. The SE EG is a solid mahogany guitar with a glued-in mahogany neck and rosewood fingerboard. 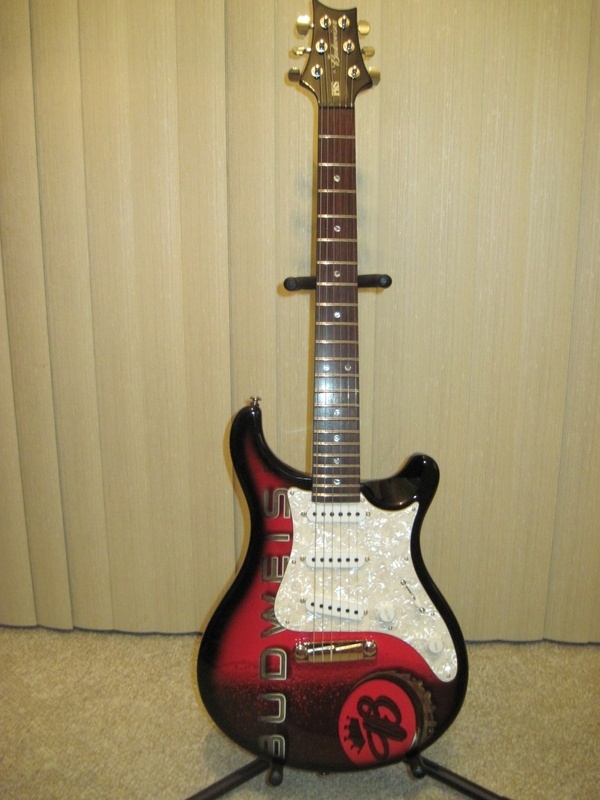 It features a 3-ply pickguard with 3 custom single coil pickups and a 5-way blade pickup selector. The SE EG is available in Antique White with a tortoise shell pickguard, Metallic Red with a white pickguard and Metallic Blue with white pickguard or Limited Edition Budweiser Graphic. I'm very interested in the bridge design!! And I have also learned how to set my intonation(PROPERLY) from observing this bridge! What an awesome collection of instruments and accessories! You should have a museum. If you ever feel the urge to donate something to a disabled vet, I'd be happy to pay the shipping. Seriously, thank you for all the videos you sold me so cheap. They have helped me a lot. I'd love to see you do one more Campfire set, perhaps using classic country songs that have some cool riffs and solos for electric guitar, like 'Sundown' and 'Take These Chains from My Heart', and "Big City Turn Me Loose and Set Me Free" for those of us who have portable battery-powered practice amps.